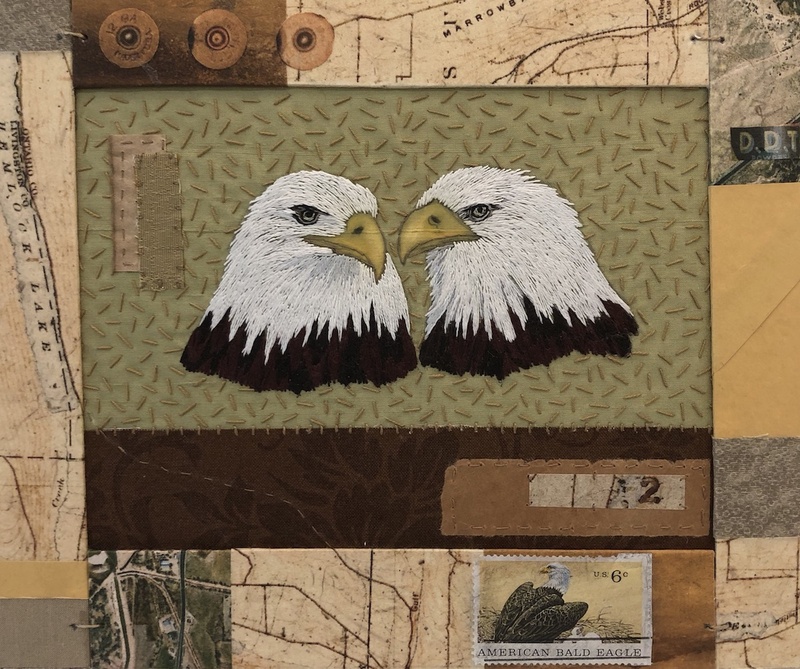 Bald Eagles by Marie Hassett, part of the artist's show at Art Dialogue Gallery. Currently on display at Artists Group Gallery, works of three radically disparate artists—Henry Schmidt’s formalist sculptures in metal, George Gilham’s neo-impressionist oil paint on filmstock nature vignettes, and Marie Prince’s idyllic nostalgic scenes of childhood acrylic paintings—while in the adjoining Art Dialogue Gallery, a score or so of Marie Hassett’s exquisite fabric and collage art depictions of birds of various species, and thoughts about species survival—or not—in the modern world. Amidst the metal sculptures, a few anomalous—and notably beautiful—works in wood. Such as a lovingly finished blond maple more or less column culminating in a form that plays on the title word Fluke, as one half of a whale tail, but also, perhaps, the fortuitously elegant original form of the matrix wood piece, that would have suggested the ever-impressive—often photographed—final glimpse view of a whale cresting event. Or a Noah’s ark with disk semi-circle hull and undulant gunwale, evocative in this case of ocean waves. George Gilham refers to his nature views as “deconstructed landscape.” He likens the appearance of the works to things seen “at a glance, or as a blur…as colors, shapes, and small segments of structure,” interspersed with “areas of abstraction.” Monet would have understood. The paintings are uniformly diminutive in size—about four inches by six inches—except for one larger work mounted to stunning effect on a light box, called Illuminating Garden, Champaign, Ill. Showing what seems to be a lush flower garden and pedestrian bridge over water, reminiscent of Monet’s iconic impressionist depictions of his gardens at Giverny. Most of Gilham’s other locales are closer at hand. Letchworth State Park, Reinstein Woods, Zoar Valley, Canalside, and one work is called Sunflowers on Pavement Road, Lancaster. Labels consist of a synopsis title word and name in parentheses of the depicted species, followed by a short paragraph on the survival status—or alternatively, fate—of the species. Such as Remembrance (Carolina parakeet), and information that the species “once ranged over the United States as far north as New York. They vanished in the wild due to woodland destruction and ruthless hunting. The last pair…were cage mates at the Cincinnati Zoo for over thirty years,” but both succumbed within the past year or so. Other synopsis title word Remembrance works are about the Labrador duck and the Pink-headed duck. The Artists Group Gallery three-artist exhibit continues until August 17. 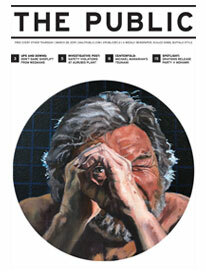 The Art Dialogue Gallery Marie Hassett exhibit until August 31.